The Ministry of Interior has set up the centre for accident prevention and assistance to handle traffic emergencies during the notorious 7-day dangerous period from April 11-17. The centre went into operation yesterday after officially opened by Interior Minister Gen Anupong Paochinda yesterday. 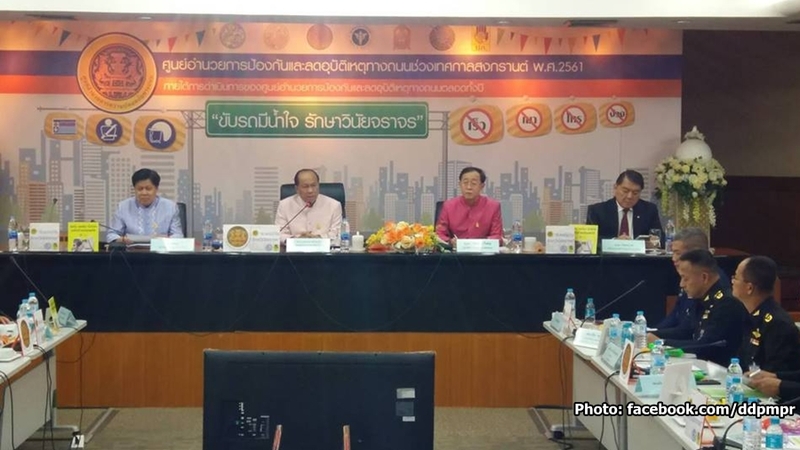 The centre has listed risky locations in 198 districts where authorities will take care if closely to ensure safety travel by Songkran revellers during the 7-day dangerous period. Gen Anupong said he has ordered all departments to coordinate efforts and ensure that traffic laws are strictly enforced during the period. Special community checkpoints manned by volunteers have also been sanctioned to help police on secondary roads while a high alert has also been ordered at risk prone locations in 198 districts. In addition, he said security personnel have been ordered to strictly observe six measures which are mainly targeted at lowering risks for the general public, road safety, environmental conservation, motor vehicles safety, providing security for tourists, marine safety and emergency reaction measures in the event of accidents. Meanwhile the Royal Thai Police deputy commissioner Pol Gen Chalermkiat Sriworakharn also ordered strict security measures to be enforced at all 10 popular festive locations within Bangkok to prevent criminals taking advantage of the situation to commit crimes or create disturbances. Some of these include Central World Shopping Center, Silom and Khao Sarn Road. A ban on alcohol has also been ordered at these locations as well as strict dress codes. High power water pistols are also forbidden. He said in Bangkok, 137 checkpoints will also be set up to provide public safety and security. The Court of Justice meanwhile is reported to be coordinating with the Department of Probation to employ EM (Electronic Monitoring) to keep track of motorists with drunk driving records in particular those who were caught with 200 -250 milligram per cent) to further enhance road safety during Songkran.